Mike Hernandez is only still fighting in MMA because a stranger in a bar once told him not to stop. Hernandez has an impressive record of 10-2 as a professional and went undefeated 5-0 as an amateur, but at one point, he was going to quit. Then, on the brink of quitting MMA while drinking with friends in a bar, a man approached Mike. That made Mike decide to stick around MMA for a little while longer. Mike has always been a selfless person in this way. He never wanted to start fighting, his dad wanted it. Mike would have rather played hockey, but it was much more expensive than wrestling, or his real passion of playing football, but he was a linebacker at only five foot five inches tall and didn’t get much play time. However, he regrets quitting football his senior year in high school. As with many 18 year old men, without school or sports Mike had a chip on his shoulder and got into trouble. He started fighting in the streets, a lot, and word got around that he was a wrestler and a tough guy. One day, Ben Lagman, a fighter from a local MMA gym approached Mike and said he should try out MMA, because he’d be good at it. So Mike went. After only one month of training, Mike fought in a cage. He fought and won five amateur bouts but admits he didn’t learn much. 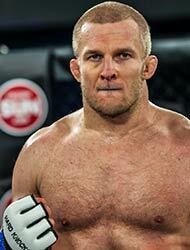 His aggressive style and street fighting experience along with years of wrestling seemed to carry him through his amateur career and his first two professional opponents. He only trained a few times a week, not being that serious, and still beat his competition. “I only started Jiu Jitsu when I lost for the first time, in my third pro fight,” Hernandez said. Mike won two more pro fights after starting Jiu Jitsu, but then lost again and was ready to quit. His friends and teammates told him to take it seriously, take it all the way or get out. After the stranger in the bar inspired him, Mike decided to put his full time and energy into fighting. When you ask Hernandez about living the fight life, he is honest. The one thing Hernandez does enjoy is the fans. He says he has “crazy” amounts of people that love watching him, which he attributes to his 80% KO/TKO rate and his big family. He fights for his family, he fights for the fans and for a third group of people very important to him; American soldiers. Hernandez says he is one or two fights away from the UFC and he’s gunning for it. Get your exclusive Fan Rates!